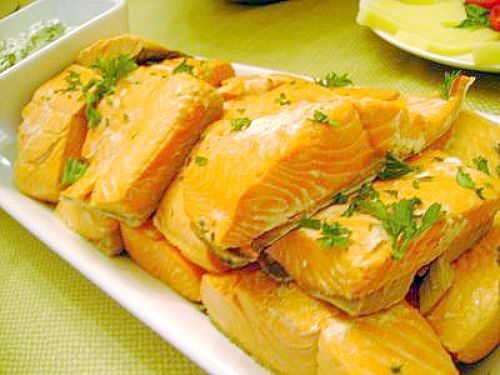 SALMON: Place salmon steaks side by side in large skillet or pot. Add white wine and water just to cover steaks. Add celery leaves, onion, lemon, peppercorns, bay leaves and salt. Cover and bring to boil. Lower heat and simmer 20 minutes. Cool. Chill in liquid. MAYONNAISE: Combine ingredients in bowl and season with salt. Chill.